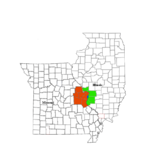 Monroe County is a county located in the U.S. state of Illinois. According to the 2010 census, it had a population of 32,957. Its county seat and largest city is Waterloo. Monroe County is included in the St. Louis, MO-IL Metropolitan Statistical Area. It is located in the southern portion of Illinois known locally as "Little Egypt". Indigenous peoples lived along the Mississippi River and related waterways for thousands of years before European contact. French Jesuit priests in the Illinois Country encountered the Kaskaskia and Cahokia, bands of the Illiniwek confederacy. The first European settlement in this area was St. Philippe, founded in 1723 by Philippe François Renault, a French courtier, on his concession about three miles north of Fort de Chartres along the Mississippi River. This early agricultural community quickly produced a surplus, and grains were sold to the lower Louisiana colony for years. They were integral to that community's survival, as its climate did not allow cultivation of such staple grains. After the American Revolution, Monroe County was formed in 1816 out of Randolph and St. Clair counties, as the 8th county created from the then Illinois Territory. Beginning on the Mississippi River where the base line, which is about three-fourths of a mile below Judge Briggs's present residence, strikes the said river; thence with the base line until it strikes the first township line therefrom; thence southeast to the southeast corner of township two south, range nine west; thence south to the southeast corner of township four north, range nine west; thence southwestwardly to the Mississippi, so as to include Alexander McNabb's farm, and thence up the Mississippi to the beginning shall constitute a separate county, to be called MONROE. It was named in honor of James Monroe, who had just served as United States Secretary of War and who was elected President later that same year. Its first county seat was Harrisonville, named for William Henry Harrison, former governor of the Northwest Territory and future President. Harrison invested in several tracts of land in the American Bottoms above Harrisonville, mostly in the present precinct of Moredock, ownership of which he retained until his death. Waterloo was designated as the mantle of county seat in 1825. The sites of the colonial towns of St. Philippe and Harrisonville were submerged by the Mississippi River, in flooding caused by deforestation of river banks during the steamboat years. Crews cut so many trees that banks destabilized and collapsed in the current, making the river wider and more shallow from St. Louis to the confluence with the Ohio River. This change caused more severe flooding, as well as lateral channel changes, such as the one that cut off the village of Kaskaskia from the Illinois mainland. An unincorporated community of Harrisonville was re-established east of the original site. The bounds of Monroe County in 1816 did not include Precincts 1 and 6 (village of Hecker and Prairie du Long), Precinct 1 and most of 6 was added in 1825 from St. Clair County. The strip of Precinct 6 from the survey township line east to the Kaskaskia was added, once again from St. Clair, two years later in 1827. Some minor adjustments and clarifications of the boundaries have taken place, but the borders have remained essentially static since 1827. According to the U.S. Census Bureau, the county has a total area of 398 square miles (1,030 km2), of which 385 square miles (1,000 km2) is land and 13 square miles (34 km2) (3.3%) is water. The western part of the county on the Mississippi River is part of the American Bottom floodplain, while the eastern portion of the county is relatively flat and was originally prairie. The transition zone between has high bluffs of limestone and dolomite and has distinctive Karst topography with numerous sinkholes, caves, and springs. In recent years, average temperatures in the county seat of Waterloo have ranged from a low of 20 °F (−7 °C) in January to a high of 89 °F (32 °C) in July, although a record low of −18 °F (−28 °C) was recorded in December 1989 and a record high of 107 °F (42 °C) was recorded in August 1962. Average monthly precipitation ranged from 2.32 inches (59 mm) in January to 4.25 inches (108 mm) in July. As of the 2010 United States Census, there were 32,957 people, 12,589 households, and 9,375 families residing in the county. The population density was 85.6 inhabitants per square mile (33.1/km2). There were 13,392 housing units at an average density of 34.8 per square mile (13.4/km2). The racial makeup of the county was 98.0% white, 0.4% Asian, 0.2% American Indian, 0.2% black or African American, 0.3% from other races, and 0.8% from two or more races. Those of Hispanic or Latino origin made up 1.4% of the population. In terms of ancestry, 53.9% were German, 16.5% were Irish, 9.6% were English, and 6.2% were American. Of the 12,589 households, 34.7% had children under the age of 18 living with them, 62.9% were married couples living together, 7.9% had a female householder with no husband present, 25.5% were non-families, and 21.5% of all households were made up of individuals. The average household size was 2.59 and the average family size was 3.02. The median age was 41.0 years. The median income for a household in the county was $68,253 and the median income for a family was $80,832. Males had a median income of $55,988 versus $39,375 for females. The per capita income for the county was $31,091. About 3.5% of families and 4.5% of the population were below the poverty line, including 4.3% of those under age 18 and 2.4% of those age 65 or over. historic route from Kaskaskia to St. Louis, leaves Illinois Route 3 south of Waterloo, passes through Burksville and St. Joe, descends into the Bottoms outside Renault, crosses Bluff Rd. and railroad tracks to Stringtown Rd. Runs from Route 3 west, past New Hanover down the Fountain Gap to Bluff Rd. at Miles Rd. and B Rd.. Marks approximate future border between Columbia and Waterloo. There is a regular MetroBus express bus, 502X Waterloo-Columbia, running from Waterloo, through Columbia, to the MetroLink station in East St. Louis. The closest access to and bridges over the Kaskaskia are downriver at Baldwin in Randolph County and upriver at New Athens in St. Clair County. South of Monroe County, there is a ferry across the Mississippi in Randolph County, providing access to Ste. Genevieve, Missouri and Pere Marquette State Park, and a bridge at Chester. While the railroad played a large part in the history and development of the county, the main line through the county, running along Illinois Route 3, has been abandoned and removed. However, Union Pacific tracks run through the Bottoms from the intermodal yard at Dupo in St. Clair County, running roughly parallel to Bluff Rd. which crosses them several times, through old Valmeyer and Fults on past Prairie du Rocher in Randolph County. The tracks are still in use, but carry only freight, and have no stops in Monroe County. There is a small airfield in the Bottoms west of Columbia called Sackman Field. For census and election purposes, Monroe County is currently divided into 26 numbered precincts (1-27, for some reason there is no Precinct 14). However, for geographical, genealogical, and historic purposes the older, named precincts are of greater utility. named for the ubiqitous limestone cliffs it sits atop and which run along its western bounds. from hybrid French/English "Long Prairie", it was added in 1825, after the county's genesis, the strip along the river in 1827. As part of the historically German-Catholic belt of southern Illinois, Monroe County was hostile to the “Yankee” Civil War and voted solidly Democratic until Theodore Roosevelt carried the county in 1904. Since that time, however, the county has become powerfully Republican, and the only Democrats to gain a majority since 1904 have been Catholic Al Smith in 1928, Franklin D. Roosevelt in 1932 and 1936, and Lyndon Johnson in 1964. Since 1968, Monroe County has been carried by the Republican Presidential nominee in every election except when Bill Clinton gained a narrow plurality in 1992. Nonetheless, Hillary Clinton’s 2016 performance was the worst by a Democrat since John W. Davis in 1924, and the worst in a purely two-party contest since James M. Cox in the preceding election. ^ Counties of Illinois, p. 32-33. With Twenty-three Maps Showing the Original and the Present Boundary Lines of Each County of the State, Retrieved on January 22, 2008. ^ Gannett, Henry (1905). The Origin of Certain Place Names in the United States. U.S. Government Printing Office. p. 212. ^ "Counties of Illinois pg. 46-47". 1825 Retrieved on January 22, 2008. ^ "Counties of Illinois, pg. 49-50". 1827 Retrieved on January 22, 2008. ^ a b "Monthly Averages for Waterloo, Illinois". The Weather Channel. Retrieved 2011-01-27. This page was last edited on 11 November 2018, at 16:10 (UTC).